In the late 1990s, I often used to visit the facsimile pioneer herb garden next to the historic Scadding Cabin on the grounds of Toronto’s Exhibition Place. With permission, I harvested some garlic there, and for the past fifteen years, I’ve been poking its descendants into the ground in various gardens. It was the first crop I sowed in my community garden plot, and it appears year after year in my backyard, entirely neglected and with no sun at all. Over the years I’ve become very fond of this resilient, unearthly looking plant that makes itself so welcome in the kitchen. I didn’t think much about garlic farming until I read the delightful book A Garlic Testament: Seasons on a Small New Mexico Farm by Stanley Crawford. Until then, I hadn’t even stopped to wonder whether you can grow garlic in Toronto. Most of the garlic displayed by my local grocers comes from China, which grows more than three-quarters of the world’s supply. Nonetheless, garlic grows well in a fairly wide range of climates, from scorching California summers to snowbound Canadian winters. Few insects or microscopic organisms prey on it, and its odour even helps protect other plants from pests. There are hundreds of varieties, with romantic names like Porcelain, Rocambole, Silverskin, and Turban, but they all fall into two basic types. 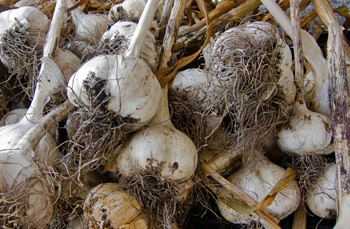 The first, Allium sativum, or softneck garlic, is dependent on human cultivation because it grows from the cloves, which need to be separated artificially or the plant will soon crowd itself out. The second type, the kind I harvested at Scadding Cabin, is my favourite. Allium ophioscorodon, known as hardneck, top-setting, or bolting garlic, grows from bulbils that sow themselves. Like the cloves, they can be planted in the fall, and they perform a fabulous series of metamorphoses through their life cycle. In the first year, they appear as a sturdy grass-like stalk. The second spring, they send up a sturdy blue-green stem that soon develops a pointy greenish-white tip and starts to form a series of graceful loops. 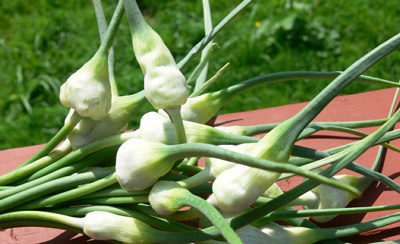 If you cut the stem off at this point, you’ll have the tender green vegetable called garlic scape. If you don’t cut off the scape, it eventually swells into something resembling a new garlic bulb , which contains a cluster of seeds that look a bit like unpopped popcorn: these are the bulbils. As the summer progresses and the leaves start to die back, you should stop watering to encourage it to grow. When the stalk is completely dry, you can harvest your garlic, digging it gently out of the earth. Once harvested, it can be dusted off and hung to dry; later, you can trim off the stalk and root ends, rub off the dirty outermost layer of skin, and start cooking. Through the cold months, I leave a few bulbs in the ground; it’s comforting to know that they’re there if I ever run short—just as it must have been to pioneers like those who inhabited the Scadding Cabin two hundred years ago. Combine all ingredients in a small jar with a lid. (Ingredients can be varied to taste and according to what’s available.) Close lid and shake well. Refrigerate until needed. Use as a salad dressing or as a marinade. Sarah B. Hood's latest book is "We Sure Can! How jams and pickles are reviving the lure and lore of local food", and she blogs at Toronto Tasting Notes totastings.blogspot.com.